Once you have completed the factory reset for troubleshooting purpose you should be assured your Mac is now in a pristine state the same as when you first received your Mac. If troubles should persist it is likely a good indication of internal hardware or external peripheral related issues. Once all of the steps are complete, you can sell your Mac knowing the buyer will receive a well-seasoned Mac with a new, pristine operating system installed, ready to enjoy just as you did when you first bought it. You'll also be assured that all of your data is gone from the Mac, never to be seen again. Usually, in our How-To articles, we include a list of items you'll most likely need to perform a task. In this case, the list is going to be general in nature; depending on the model of the Mac you're selling, you may not need anything more than an Internet connection to prepare your Mac for resale or recycling. An external backup drive if you're going to completely back up the Mac you're putting up for sale. A network connection, or the ability to mount the external drive containing the backup you made on your new Mac. Either method will work for migrating your data to the new Mac. An internet connection, primarily for downloading and installing a clean copy of the Mac OS, but also for deactivating accounts that may be tied to the old Mac. This includes iTunes, iCloud, Messages, and social media accounts, such as Twitter or Facebook; you get the idea. If you're connecting via Wi-Fi, you may need your Wi-Fi password during the reinstall of the Mac OS. Don't worry though; the Wi-Fi password is only needed during the download of the Mac OS. A couple of hours of your time. Thankfully, you won’t need to be present for the entire time as the backup, migration, and system install can be started and left to run on its own for the most part. Original media (CD/DVDs) and manuals that came with the Mac you're selling. These may not be required for a successful sale, but they can be icing on the cake to attract a buyer. Your old Mac is likely to be chock full of personal information, documents, projects, favorite apps, games; the list goes on, and it's unlikely you want to just get rid of all of this data when you erase the drive. That's why one of the first steps to take is to back up your Mac's data. We recommend creating a clone of the Mac's startup drive, as well as a clone of any additional internal drives your Mac may have. You can use Disk Utility to create a bootable clone, though we prefer using either SuperDuper or Carbon Copy Cloner for creating my bootable clones. Creating a bootable clone allows you to easily access the cloned drive by connecting it to your Mac; a startup drive can also be used as the source for the Mac's Migration Assistant should you wish to move data to a new Mac. Don’t forget that you need to back up any internal volume on your Mac, not just the startup drive. If you have more than one drive, or if you have partitioned your internal drive into multiple volumes, each and every volume needs to be backed up or cloned. Your new Mac comes with a Migration Assistant that will automatically run during the setup process. The Migration Assistant can transfer data from your old Mac as long as it's still connected to your local network. You can also choose to migrate data using a recent Time Machine backup, or from a startup drive (such as the clone you created in the steps above) that's connected to your new Mac. No matter which method you decide to use, you may find the following guides helpful in transferring data to your new Mac. Once you have the backup in place, it's time to start removing ties your favorite apps and services may have to your old Mac. This can include deauthorizing your Mac from playing music and videos in iTunes, disassociating the old Mac from iCloud, as well as de-licensing your Mac from third-party apps that license the app to a specific Mac. This can include products such as Adobe Creative Suite, as well as most subscription-based applications you may be using. Sign out of iTunes: Launch iTunes, and then select Accounts, Authorization, Deauthorize This Computer. Enter your Apple ID password when requested, and then click the Deauthorize button. Sign out of iCloud: Before signing out of iCloud, you may want to make copies of any important data you're storing in iCloud. This is mostly a precautionary step, since the data in the cloud should still be present when you sign back into your iCloud account with your new Mac. Pay particular attention to backing up Contacts and Calendar data, as the process isn't readily evident. Also, if you're storing your favorite photos in iCloud, make sure you have a local copy. Launch System Preferences, either by clicking its Dock icon or selecting System Preferences from the Apple menu. In the list of iCloud services, make sure Find My Mac and Back to My Mac are unchecked. Click the Sign Out button in the iCloud preference pane. Launch the Messages app, and then select Preferences from the Messages menu. Select the Accounts tab. For each account listed in the sidebar, click the Sign Out button. If you're using two-factor authentication with your Apple ID, you'll also need to remove your old Mac from the list of trusted devices. In the Security section, check whether you've enabled two-factor authentication. If you see a link labeled Get Started, then two-factor authentication hasn't been turned on, and you don't need to do anything. Otherwise, you'll see a list of trusted devices. Be sure to remove your old Mac from the trusted devices list. Note: This is not the same as the list of Devices you are currently signed in with. Many third-party apps use a licensing system that is tied to your Mac. In general, this type of license needs to be deactivated so you can re-activate the license on your new Mac. Many apps place the licensing controls within the app's preference system, or in the Help menu. 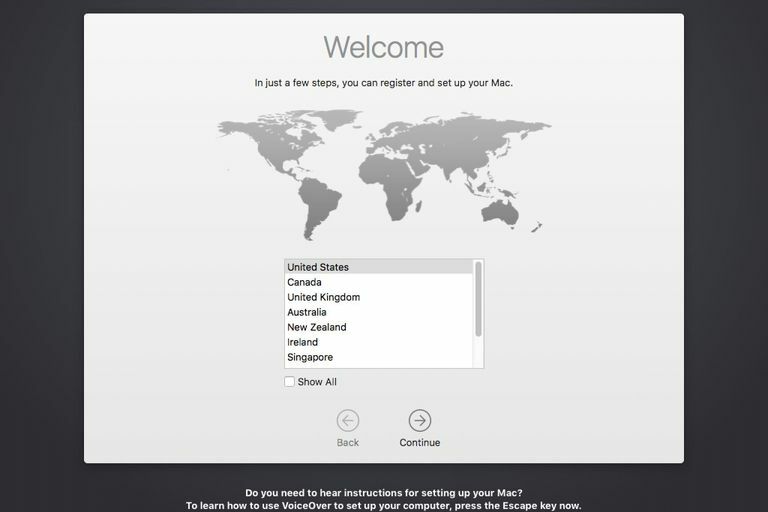 Check each location for information on how to deactivate your Mac. If you need assistance, contact the app developer. Warning: The next steps will completely erase the data on the internal drive(s) of your old Mac. Do not proceed if you haven't backed up the data. To erase the internal drives and all associated volumes, we're going to make use of Disk Utility to erase and format the drives. Because the process involves erasing the startup drive, you'll need to use the Recovery HD partition to perform the task. Once you start this process, there's no turning back, so this is your last chance to make sure you have all your needed data on a backup or clone. If you're using a wired keyboard, you can immediately hold down the Command and R keys until you see the Apple logo. Alternatively, you can restart while holding down the Option key. When you see the list of available drives to start up from, select the Recovery HD drive. If you're using a wireless keyboard, the process is nearly identical. The difference is you must wait until you hear the startup chimes before holding down the Command and R keys, or, alternatively, holding down the Option key. Your Mac will boot using the Recovery HD partition that is hidden on the startup drive. Once booting is complete, you'll see the macOS Utilities window (in older versions of the OS, this window is called OS X Utilities). Click the Disk Utility item in the window. Disk Utility's erase process includes security options that allow you to select multi-pass erase options that can make it almost impossible to recover any data from the drive. The security options can be used for any hard drive you're erasing, with the only drawback being the amount of time the secure erase will take (hours, or even a day for large disks). You should not, however, use secure erase options for an SSD, as the multi-pass data write used in the secure erase system can lead to early failure of an SSD. Once you have finished the erase process, you're ready to reinstall the Mac OS. You should still be booted into the Recovery HD volume and have the macOS Utilities window open. If not, repeat the process outlined above to restart into the Recovery HD volume. In the Recovery HD Utilities window, select Reinstall macOS (or Reinstall OS X, depending on the version of the operating system you're using), and then click the Continue button. While the above guides are helpful for the installation process, the reinstall process as performed using the Recovery HD system is pretty straightforward, and you can get by just following the on-screen instructions. Do not complete the installation process! Instead, when your Mac restarts, displays the Welcome screen, and asks you to pick a country or region, simply press Command + Q on your keyboard (that's the command key and the Q key, pressed at the same time). This will cause your Mac to shut down. This is important because when you give your old Mac to its new owners and they start it up, the Mac will automatically launch the Setup Assistant, exactly as it did when you first brought your new Mac home and started it up all those years ago.